Dr John La Salle: enthusiastic, internationally renowned entomologist who championed open access to biodiversity information. Dr John La Salle, an affable and charismatic scientist who paved the way in digital innovations, died unexpectedly on Sunday 27 May, aged 67. 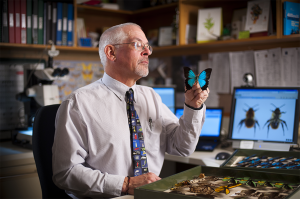 Throughout his scientific career La Salle made a significant contribution to insect taxonomy and spent a decade as Director of CSIRO’s Australian National Insect Collection in Canberra. In recent years, as Director of the Atlas of Living Australia, he was instrumental in unlocking the information stored in Australian museums, herbaria, other collections and databases, and making this data more accessible and useable online. He grew the Atlas of Living Australia into a rich database that is generating new efficiencies and possibilities for research, taxonomy, collection curation, natural resource management, policy development, land-use planning, education and citizen science. Born in Pasadena, California in 1951, John collected insects from a very young age, images reflect him as early as 6 years old with a net collecting insects with his brothers. One of his hopes was that his great-grandchildren would have access to the same biodiverse environment that he was able to enjoy in childhood. La Salle received his PhD in Entomology from the University of California Riverside in 1984 and published more than 140 papers together with 175 co-authors from 30 countries. As a scientist, La Salle was interested in many aspects of parasitoid wasps (Hymenoptera), including their biology and evolution and their significance in natural and agricultural ecosystems. He amassed 20 years’ research experience in the systematics and biology of parasitoid wasps and one of his main contributions to entomology was in helping to classify the family Eulophidae (Chalcidoidea). This is a large family containing just over 5,000 described species many of which are of extreme importance to agriculture and horticulture, both as natural enemies of pest species, and in many cases as deliberately introduced beneficial biological control agents. John worked in particular on the Eulophidae associated with pest insects, including the notorious citrus leaf miner, one of the worst pests of citrus fruits globally. John became Director of the Australian National Insect Collection (ANIC) in May 2001, after moving from London with his young family where he worked at the Centre for Agriculture and Biosciences International based at the Natural History Museum and Imperial College. During John’s 11-year Directorship he was responsible for a collaborative project with the International Barcode of Life (IBoL), to electronically ‘barcode’ part of the national collection. ANIC was the first national collection to integrate barcoding for a major group of insects. Through this project, about 65 per cent of Australia’s 10,000 known species of moths have had their unique genetic code recorded and made available through the Atlas of Living Australia and ANIC websites. La Salle embraced digital technology and championed its contribution to science early on. He was interested in applying new technologies to better understand, monitor and manage Australia’s animals, plants and microbes, especially in light of food security, emerging diseases and changing climates. He played a key role in establishing the Atlas of Living Australia in 2006, and became its Director in 2012. Now, in 2018, the power of big data and the impact of open source technology is apparent in many different sectors. La Salle was an early adopter of this technology and was instrumental in promoting open access and open source technology to bioinformatics. Under his guidance, the Atlas of Living Australia has been at the forefront of a transformation in biodiversity data management. Technology developed by La Salle’s team at the Atlas of Living Australia is being used by 15 countries across the world to collect, manage and share biodiversity data. La Salle was very proud of the Atlas of Living Australia team and their achievements. He was known to all his colleagues across CSIRO, and the international scientific community, as a lively personality with a love of people, a passion for the environment and a gift for languages and bringing people together. He is survived by his wife Cigdem and their two sons Sam and Alex, and two brothers, Mark and Skip.